The cult of the automobile, which since the great Paris-Bordeaux race of 1895 has been adopted with enthusiasm almost amounting to passion by the inhabitants of the French capital, enjoys a continually increasing following in the Metropolis. It really dates from the month of November, 1896, for it was then that, by the passing of the Light Locomotives Act of 1896, it became possible for Londoners to use self-propelled carriages in the streets of their city. Notwithstanding the legal disabilities in the matter of speed under which automobilists at first laboured, the use of mechanically propelled vehicles employed for pleasure-driving, for goods transport, and for passenger traffic has increased to such an extent that the passage of a motor car through the crowded streets of the town or the comparatively lonely roads of our huge suburbs, now scarcely provokes remark or tempts a passerby to turn his head in curiosity. Slowly, but very surely, the horseless vehicle, devoid of nerves, muscles and sinews liable to shock and pain, has effected a revolution in the traffic of our London streets. The time is not far distant when all utilitarian vehicles as opposed to carriages used by London Society for pleasure and ostentation will take the form of road machines depending upon a mechanical economy for their propulsion. amongst his fellow users of the road. Prejudice against any novel form of street traffic dies hard, particularly with our friends the omnibus driver, cabby, and the carman. These honest folk, who for ages past have esteemed themselves the very salt of the roadway, naturally resent the coming of the new form of travel just as keenly and as bitterly as did the whips and guards of the old stage coaches. But in such opposition they do but re-enact the part of Mrs. Partington with her mop ; and their ill-judged and illtempered opposition can no more set back the period when a horse-drawn vehicle will be as infrequent a sight on our London streets as a motor car formerly was, than could the old lady above referred to stem the oncoming tide with her useful household implement. Serious opposition and injustice such as automobilists have suffered from have had just the effect that the opposition of a nonprogressive majority to a progressive minority invariably entails. It has caused that minority to combine for their mutual protection and for the advancement of the cause they have at heart and the objects they have in view. The concrete result of that combination is the Automobile Club of Great Britain and Ireland, which is the headquarters of Motoring London. To this club, now an influential and potential body, every automobilist of good social standing considers it a duty to his cult to belong. From very small beginnings, in comparatively humble premises in Whitehall Court, it has advanced in an incredibly short space of time to the dignity of a powerful, well-equipped and luxuriously appointed West-End club, with a noble habitat overlooking the Green Park, at No. 119, Piccadilly. To this establishment rally all men of light and leading in London who favour and who have adopted that form of road locomotion which depends for propulsion upon steam,orpetroleum spirit.orelectricity; and today the Automobile Club, with its vigorously urged propaganda, its comforts and conveniences, stands forth and is recognised as a power and an influence to be reckoned with. During its existence the Club has performed wonders in introducing automobilism to the country generally, and the London public in particular. It has held exhibitions, organised trials, arranged runs and tours, fought legal cases a outrance in the interests of the movement, and continues and will continue in these good works for many a day to come. Within the Club are discussed all the subjects at the moment on the tapis with the world of automobilism. There the latest home or Continental news, of great trials or events, new inventions and introductions which may or may not revolutionise the outward appearance or the internal economy of automobiles are discussed from every point of view. But foremost of its aims is the watchful safeguarding of such liberties of the streets and highways as it has already secured, and in this regard and in still further advancing the cause a mountain of labour stands always before it. Apart from the buzzing, hissing, droning presence and passage of automobiles amidst the London traffic, that which most impresses the permanency of the latest form of locomotion upon the observant citizen is the appearance of what for lack of an adequate English word are termed “Motor-Garages.” These are becoming plentifully sprinkled about the more fashionable parts of London, and have even invaded the precincts of the City itself. These establishments stand in the same relation to the automobile as do livery and bait stables to horses and carriages, for therein automobiles may be safely housed by the day, week, or hour, and while so housed are tended by skilled assistants, cleaned, furbished, and fed with water or petrol, or, be they electro-mobiles, attached by carefully insulated wires to brass studded and handled slate slabs affixed to the wall, in order that the particular form of aliment they require, so that they can roam the streets, may be conveyed to them from the electric mains. To the uninitiated the interiors of these garages present a curious appearance. They boast no stalls, no loose boxes, no mangers, their floor spaces are clear and marked only by what suggests the familiar cellar flap of the public-house. These are the covers of sinkings in the floor technically termed “pits,” into which the skilled leather-clad automobile mechanic descends beneath a car for the purpose of more conveniently effecting such repairs and making such adjustments as the carriage in hand may at the moment require. Above or below in the best appointed garages are well-equipped engineering workshops amply provided with lathes, drilling machines, benches, vices, brazing hearths, smiths’ fires and anvils, by the aid of which repairs, however heavy, can be effected to the more or less complicated mechanism of the cars. Provision in the shape of a bricked and isolated cavern is made for storage of that high distillate of petroleum known in this country as ” petrol.” Many of these establishments rejoice in more than one floor, so that when business is brisk and automobilists driving into the West-End or the City from the outlying districts of our brick and mortar labyrinth crowd the place with their vehicles, these are borne slowly aloft on huge lifts to remain in the regions above until again required by their home-returning owners. In the busy season these garages are the scenes of much animation and bustle. On the one side are cars ready to take the road, with their engines in motion and snorting as explosion engines do when running light, and as though eager and impatient to be gone into the outer air. On the other are, perhaps, steam cars, silent but for the mild roar of their burners by which steam has been raised and retained to the necessary pressure in their boilers. Then the electro-mobile, which for the whole period of its sojourn in the garage has been noiselessly absorbing power through the insulated cables already mentioned, takes its departure with quietude and dignity, and in marked contrast to the impatient snorting of the petrol car and the fretting fussiness of the steam-propelled vehicle preceding it. In corners of these establishments stand cars undergoing repair, and to the novice, strange, nay, almost uncanny, is the spectacle they present, as with motor bonnet or entire body removed they bare their ungainly mechanical details to the light of day. But for the wheels which link them to the traffic of modern times they might be well esteemed by the uninitiated as weird fossils upheaved from the nether slime. But to see Motoring London at its best, one must take one’s stand on certain of the great traffic conduits leading outwards from the metropolis, when on high days, holidays, and at week ends, all Londoners who possess engines and gear over four wheels, whirl and skir, trumpet and hoot, country-wards and seawards to escape the city for a little space. 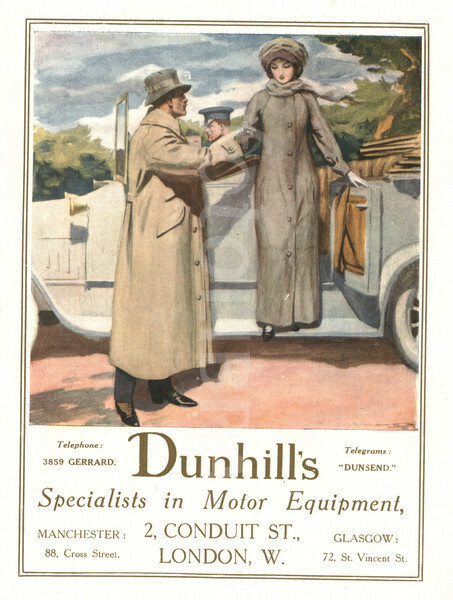 It is then, and only then, when even- minute sees the passage of a car bearing its freight of cloaked and head-shrouded women and heavily coated and goggled men to pure air and open heath, along the pleasant roads of the home counties, that the wholesale manner in which motoring has popularised itself can be fully realised. From the spitting, fast-flitting motor-bicycle, with its rigid rider, up through the gamut of motor-tricycle — carrying a single passenger or hauling a light trailer with family loads — motorquad, voiturette, light car and heavily engined automobile, roofed and hooded and screened, all sorts and conditions of the self-propelled proffer themselves in an incredibly short space of time. Motoring London makes then all haste it can to get out of London and leave the town behind it. Vehicles worth thousands of pounds surge by in one short hour, and from morn to dewy eve and late into the night the dwellers along suburban roads are never free of the roar of the passing cars.